And let's say you've worked long and hard at your digital stage piano ("at the mighty Wurlitzer," as they say) with its state-of-the-art pipe organ samples [See menu bar, Photos IV] to practice, learn, and memorize those great traditional hymns from the hymn book, songs of praise, marches, chorales, amens, fanfares, patriotic songs, anthems, armed services songs, transcriptions and excerpts from the classics ... everything the organization would ever need and then some. It's mid-morning, you're trying to create the proper mood for the meeting, and he wants to hear a beer drinking song. But he's serious about it too. Your stately playing is too boring for him. He sees a musician and wants to be entertained; that's their only purpose, you know -- at least for him. In a way, we have to feel sorry for him. In his ignorance he has no clue about all the many things that have to come together to create what he's already hearing or the skills needed to produce it; he has no clue that a hymn, as printed in the hymn book, is not piano music or organ music but choral music that the organist needs to interpret and arrange for the organ to lead the congregation. He lacks the wisdom to discern the difference between a) reproducing music as a non-musician would who plays CDs and takes requests on the one hand, and b) producing music as a musician, on the other. He also has an attitude: if he ever did had a clue about it, he doesn't care ... but at least he's not indifferent about it. The opposite of love isn't hatred; it's indifference. Now, being a musician, you know that you're not narrow minded when it comes to music ... anything good finds its way to your heart including New Orleans style jazz, ragtime and stride piano, blues, boogie-woogie, big band, swing, bop, Dixieland, fusion, Sousa marches, country, rock, pop broadway hits, classical ... anything that's good [See blog, Only Two Kinds] ... but you also know that there's a time and a place for everything, and this just isn't the time or place for anyone to be listening to "Colorado Kool-Aid." 2) you can tell him it isn't an organist he wants, it's a juke box, and THEN go about your business. 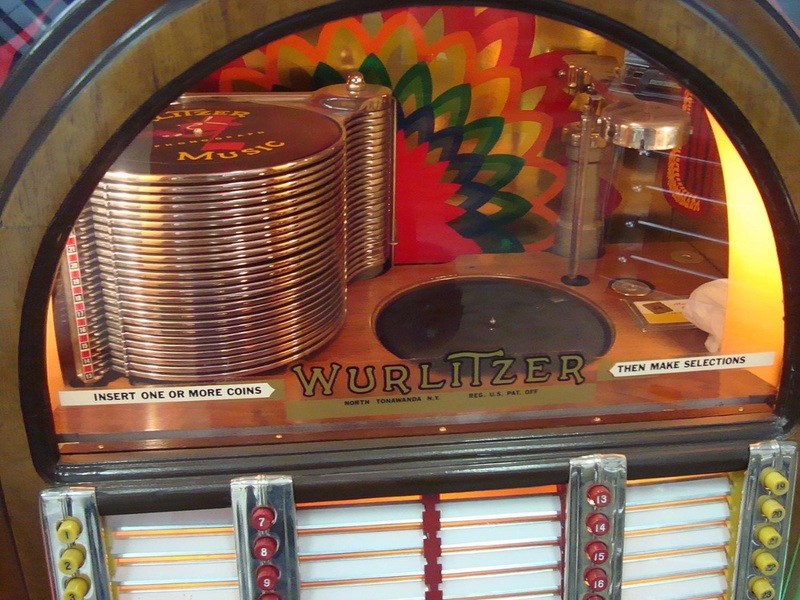 He has a different kind of "mighty Wurlitzer" in mind (photo). It's the same with other comments about the hymn playing when they're offered to deliberately tease the organist or make a joke, such as, "It's sounds like we're at a funeral!" ... these unfortunate persons should be directed to the nearest boom box or whatever else floats their boat and told that their career as a comedian is questionable at best. Seriously, it's time for the average brother of a fraternity to begin to appreciate, if he hasn't already, the preparation and practicing that goes into planning the musical accompaniment for a fraternal ceremony. If a brother wishes for a certain category of music or something special to be performed, and it's that important, then the courteous thing to do is to inform the brother musician far enough beforehand that nothing is left to chance. For example, if during a long procession of flags where the organist is expected to play uninterrupted for a half hour or more, and he's already carefully chosen and prepared the music for this event, and another brother is in charge of lining up the flag bearers, it doesn't work for that other brother to go up to the musician in the middle of the ceremony while the organist is playing and say to him, "Play more marches instead of hymns because I'm going to give them a cadence" then walk away without even demonstrating that the magic word ("please") is in his vocabulary. It's all the more ridiculous, even incomprehensible, to hear this from a well meaning brother when those same volunteers who are supposed to be marching down the aisle in procession to "a cadence" are advanced in age, many may be struggling with orthopedic problems, respiratory or heart problems, visual problems, balance problems, blood sugar problems, or side effects of medication, some are on canes, and some of them can barely hobble their way along, carrying a flag pole, without stopping; a few might even be seen carrying it the only way they can, with the flag wrapped around the pole and sticking straight out from under their arm, just to get it up the aisle. Some brethren don't seem to have a clue that by saying something like this to the organist they come across, albeit wrongly, as having a fast food mentality with respect to the music and are discourteous when it comes to working with the musician, which typically is certainly not the case ... but any remark made in return, even when the organist has a point to make, such as, "Do you want fries with that?" probably will not be interpreted in the way it's intended, either. The late Mr. W.T. Best, 19th century English organist of the city of Liverpool, was possibly an exception to this; as the story goes, at a certain civic event where he was scheduled to play the organ, an official stood up and pompously announced, "The organ will now play." When Mr. Best did not move to the organ the official looked at him and repeated again, in a louder tone, "I said, the organ will now play!" whereupon Mr. Best is quoted to have replied, "Well, I'm not stopping it." He seems to have gotten away with this because he had a point to make, a good one at that, but, again, this was a long time ago and there is no known record of how his remark was interpreted. Something of the same thing happens when a brother walks up to another brother musician he barely knows who's seated at the keys, hasn't even begun to play, and gruffly tells him, "Play something inspiring!" then walks away; this kind of pontificating can make a well meaning brother come across, wrongly, as a self-appointed guardian and know-it-all, a man who likes to listen to himself talk, when such may not be the case at all. The brother sounding off this way may indeed know something about music, he may know diddly, but it really doesn't matter; the thing to remember from this, is that, in a fraternity made up volunteers the vast majority of whom work for nothing, the organization only gets where it wants to go one way, and that's with teamwork; the brother musician, whoever he is, is a part of that team ... and a bigger part, actually, than most other fraternal brethren realize. The thing for a fraternal brother to do, in each and every situation that confronts him, always, is the brotherly thing ... in this case, when working with the organist, it's to gratefully accept what the brother musician has carefully prepared for the event that day (whenever it sounds good it's by no accident; you can bet that brother has spent considerable time planning and practicing it), give that brother some modicum of credit for his hard work, try not to get caught up in the moment, and offer suggestions to him for next time.